I'm sitting here with tears running down my cheeks. I'm pinning recipes and here's an invitation from someone willing to pray for me without even knowing me. What grace! I do need prayer - for healing, for provision to get out of debt, for peace, and freedom from anxiety, which I know is lack of trust in a Father who loves me more than I love myself. It grieves me that I can't get to the place where I trust Him completely, because He is so completely trustworthy. Thank you. God bless you and your prayer time. Sweet friend, I wish I could contact your personally but don't have any contact info. Thank you for your sweet, sweet comment. You have no idea how you were used of the Lord! I hadn't been posting the Tuesday Prayer Requests for a while because I thought no one was interested. I'd post and there'd be no comments. I surely felt convicted (but in a very, very good way by your words. 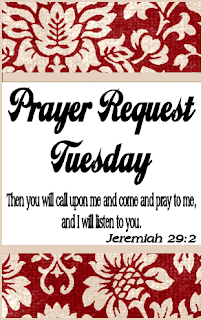 Thanks to you, the Prayer Request Tuesdays will be back.